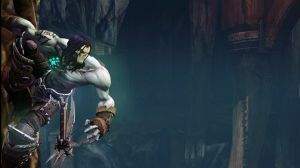 THQ has confirmed that Darksiders 2 will be out on Xbox 360 and PS3 on June 29 in UK. The publisher also today confirmed a US release date of June 26 via its Twitter feed. UK gamers who pre-order the game at GameStation or GAME (and GameStop in Ireland), are in for an extra treat - the 'Death Rides' pack. This free DLC gives you additional side-quests which let you "explore more of theMaker's Realm and Dead Plains and earn additional experience and loot. Aid an ancient Construct, battle The Bloodless and retrieve Karn's lost treasure in around two hours of unique game play content." Amazon UK pre-orders get the 'Deadly Despair' pack. THQ explains: "This unique pre-order offer adds an additional speed boost for Death's trusty steed Despair, allowing players to travel across the vast world even faster than before. This perk is a permanent increase that will last throughout the game." The 'Angel of Death' pack will also be available via a retailer that's yet to be decided. This one will give you a "unique set of enhanced armour with an angel inspired design as well as a pair of upgraded matching scythes and a exclusive visual trail for your companion crow Dust." "Darksiders: The Abomination Vault", a new novel set a millennia before the events of the first game, will be released on the same day as Darksiders 2, THQ recently confirmed. Another cool game will release this year!! Just heard that THQ close Japan branch due to Fiancial problems, just hope THQ can overcome this difficulty!